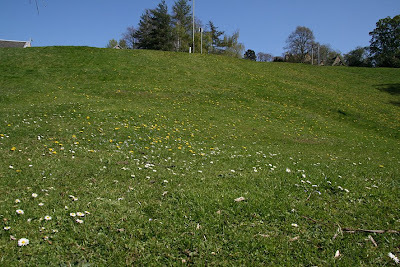 A steep grass banking of daisies, speedwell and dandelions carefully masks the location for our picnic lunch. A closer look at the skyline in the photo below reveals roof tops and road signs. 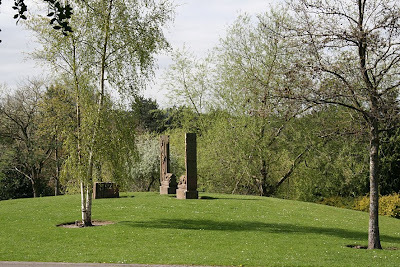 We have left the countryside lanes of our morning visit to Loch of the Lowes and are now in the heart of a city with a busy main road above us. 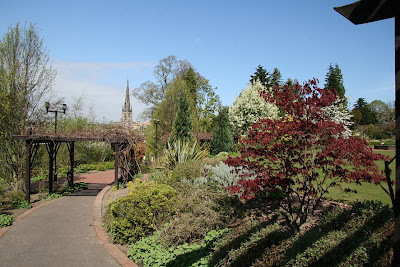 Our location isn’t a actually a secret but I do wonder how many people living in Perth (Scotland) wander down here. Being honest, I’d say pre blog I didn’t often come down here myself. 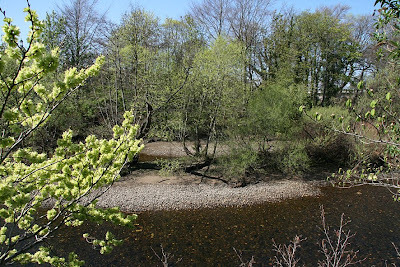 However now, camera in hand to capture all things wildlife related outside my own garden too, I have found myself popping along here to this strip of the River Tay take photos of the birds. Mallards, Geese, Gulls, Swans and Moorhens I expected to see but I didn’t know about the Goosanders and they soon became a fav to look out for. 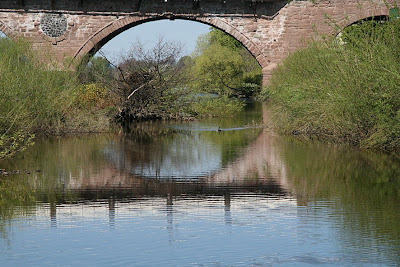 We often take some bread and walk through the gate below to the waters edge near Perth Bridge (also known as Smeaton's Bridge and, more locally, the Old Bridge). However, today we were empty handed as this lunch break hadn’t been planned. How peaceful and beautiful it was this Sunday Lunchtime. The timing of the male mallard gliding through the reflections of the arch circle was quite magical. Tiny wild flowers caught my eye growing in the wall as we walked away from the Old Bridge along the higher path towards the Queen’s Bridge. 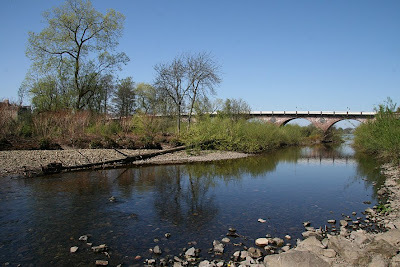 “In spring and summer, the area between the bridges is home to Sand Martins which nest in holes in the walls of the riverbank, busily darting around in search of insects. Grey wagtails can be glimpsed on the riverbank below the bridges. Dippers are small dumpy birds, with a characteristic bobbing movement, commonly seen around the ladeside. Moorhens, with their black bodies and red beaks, rear their young along the river and on the lade in the spring." Several species of ducks, geese and swans inhabit the river and its islands. Most conspicuous is the flock of feral geese, which seem to have escaped from captivity and have lived between the bridges since the 1990s. They are related to the true wild Greylag, which is thought to be the ancestor of today's domestic geese. 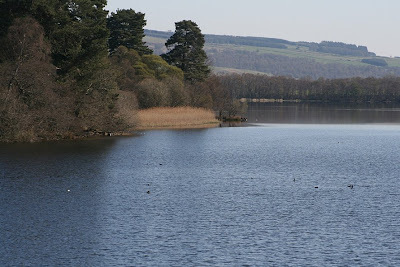 There are also feral ducks on the Tay at Perth, probably crosses between escaped domestic ducks and true wild Mallards, which are abundant here. Many ducks nest on Stanner's Island, or even in gardens along the Dundee Road. Goosanders and Mergansers are large saw-billed ducks which are often glimpsed diving in the area between the bridges. In winter, Goldeneye ducks may be seen diving off Tay Street, and are the inspiration for David Annand's bronze sculpture adjacent to the Queen's Bridge. “Whooper Swans visit in winter, sometimes congregating downriver at Sleepless Inches. Black-headed Gulls and Herring Gulls can often be seen swooping for small fish in the river. Cormorants, large glossy greeny-black birds, are more commonly seen on seashore rocks, but are equally at home fishing on fresh water rivers and lochs. Herons are striking large grey and black water birds, occasionally seen standing motionless in shallow water, particularly around the Tay islands, waiting to stab fish and frogs with their long pointed bills." I have seen a Heron here once but fortunately from where I was standing I wouldn't have been able to see it stab any frogs or fish! Now, I'll have to watch out for the Gulls fishing next time too. 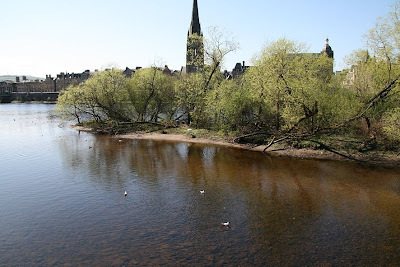 Looking down to the shallow water no fish could be seen this morning (with our eyes anyway) but the River Tay is well known and very popular in the fishing world. I did know this. Salmon is the special catch of the day here but don’t ask me on which strips. 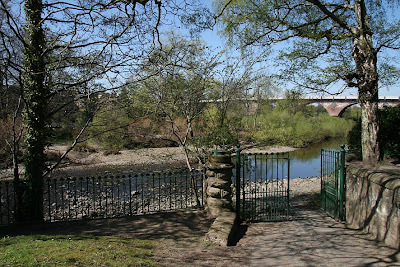 However, I did know that the heaviest salmon ever caught (by rod) in Britain was landed by a woman on this river! I had to look up her name though. 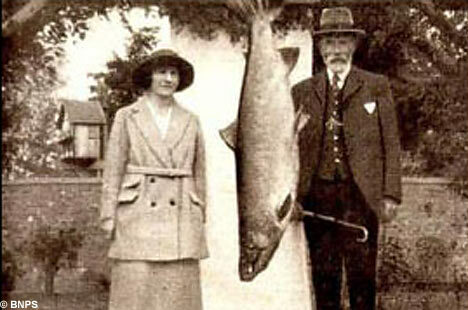 Georgina Ballantine caught her 64lb salmon further up the Tay at Caputh Bridge in 1922. Earlier this morning we had crossed that very strip of water although the original bridge has now been replaced. Every time I cross that bridge now I’ll think of Georgina and the faces of any fellow fishermen that day! "The most striking mammal to be seen here is the Common Seal, usually in winter, pursuing salmon on a high tide. If you are lucky, you may even see an Otter, another mammal which enjoys salmon. In the vaults which cover the Lade, there are Daubenton's Bats, which roost there during the daytime." This posting has certainly got me wanting to know more about the history of this area too. But wait a minute there are plants here and lots more of interest too if you want to visit. 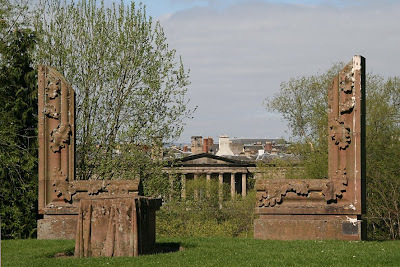 You can take a circular walk from here passing through the gardens of Norie-Millar Park then under the Queen's Bridge passing Rodney Gardens with sculptures by local artists in both. 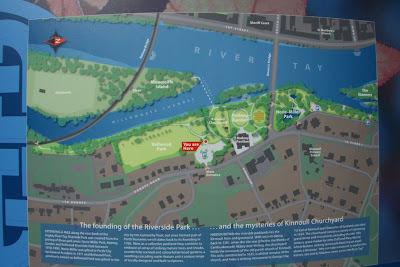 The Riverside Walk along Bellwood Park (with more sculptures) takes you over the River Tay (and the larger Moncrieffe Island with its allotments and Golf Course ) via the Railway Bridge. Walking down the steps from the railway bridge you can then walk along Tay Street all the way up to the Old Bridge where you can come down to this path again. It’s the gardens that get me to the other side of the Queen's Bridge but this morning I had other plans for an afternoon walk to quite a different setting once again. Mm... how about some pics for this too. I took a return visit one lunchtime this week and parked in the Car Park off Dundee road at Bellwood Park. The map below gives you a little idea of scale and layout of this area now. Honest Sir ‘I’ve been framed! !’ Sorry I just couldn’t resist this as the building in the centre of the frame, all the way over the other side of the River Tay, is actually Perth Sheriff Court. 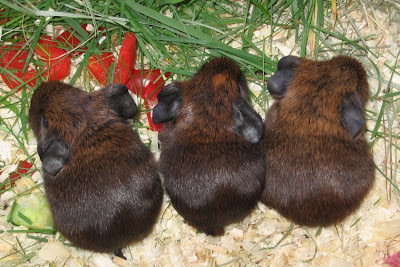 Here’s one for a Pub Quiz too… how many Jurors sit in a Scottish Court? Well, not 12 as in England and Wales. Scotland does have many Laws of its own which may surprise people outside the UK. There are 15 Jurors in Scotland as I know from first hand experience… I have been that 15th one! Moving swiftly on… there is a causeway over to Moncrieffe Island near the Rodney Gardens where pergolas and plants are in abundance. 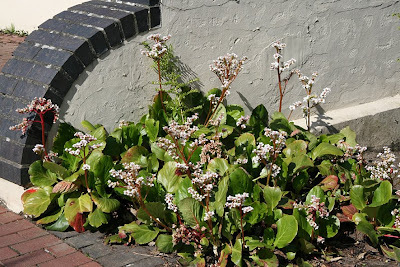 The peace messages, in different languages, on a pillar caught my eye and the pale bergenia flowers against a painted wall near a viewpoint across the river. 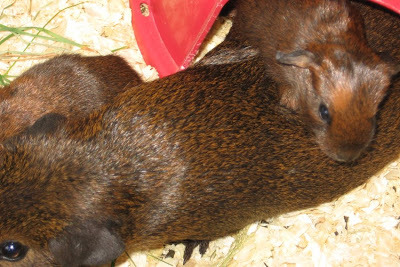 Ah… I hear you say the end is in sight… LOL… well almost! It is Friday after all and the weekend has officially started. 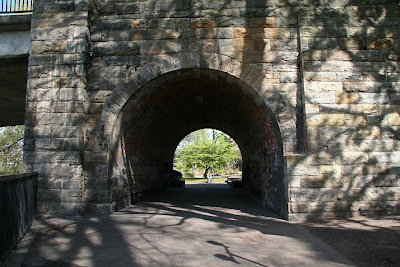 The photo below shows the tunnel under the Queen’s Bridge which will take you back to where this posting all began so very long ago. 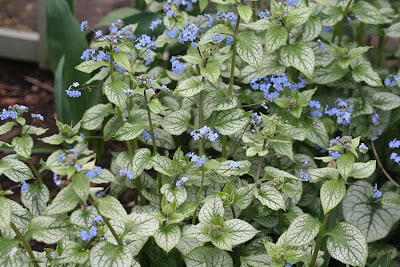 I included it more as a garden point of interest… always having a focal point no matter what way you look in your garden. 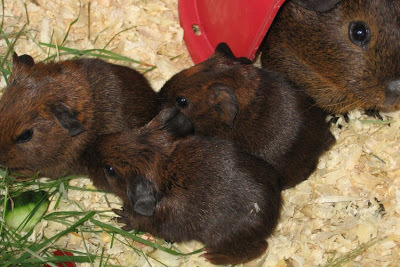 Ah… but let me take you back in time with this tunnel… a treat perhaps for those who will remember this endearing programme on our UK television screens a few or two years ago. I should stress it is the colour version I remember! I should say I didn't realise this originated in Canada. Here’s a bit of nostalgia and fun for Friday courtesy of YouTube. It has to be…. Tales from the Riverbank!! All photos above before the map were taken on Sunday April 19th 2009. All photos from the map to the end were taken on April 23rd 2009. …began my three centre trip last Sunday. However, it wasn’t the female Osprey (sorry dear I know you’ve just laid three eggs making your tally to a staggering 55) but it was the tree blossoms and wild flowers on the roadside that caught my eye. Well, that’s thing about a trip out it’s the unexpected that makes the day don't you think. 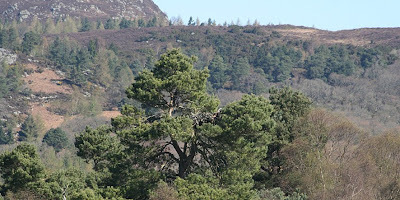 Oh… don’t get me wrong, it is still fascinating stuff to see video footage of the action on this tree top Osprey nest which you can see both inside the centre and live online too. No… dandelions were not what caught my eye and the shot I ended up searching for this Sunday morning. 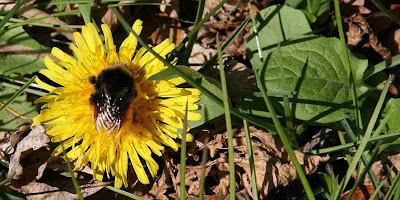 Although, it was nice to see a bee out enjoying this wonderful sunshine yellow flower! 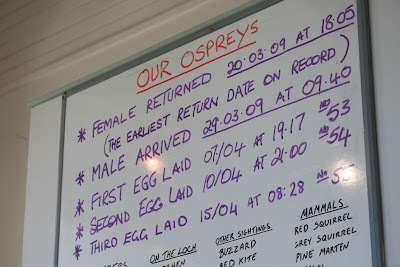 Let’s go into the centre first for some stats on the Ospreys nesting at Scottish Wildlife Trust Loch of the Lowes courtesy of the wipeboard hanging on the wall. 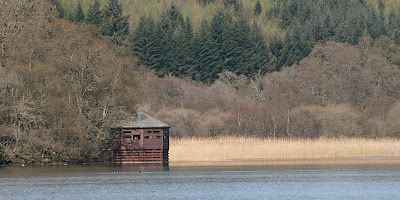 The female Osprey nesting at Loch of the Lowes has been coming to this same nest for 18 years now which is amazing don’t you think. A member of staff was talking through some of the captured and live video footage of the Ospreys zooming in to show more detail of the head of the male Osprey who was sitting on the nest at the time. 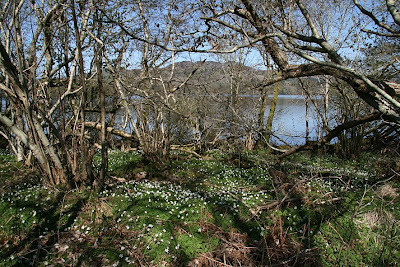 We decided that the hides, where you have views of across the Loch, might be quiet. The early morning view across the water was so peaceful looking. Generally there is a sign outside bird hides requesting that you keep quiet inside which we saw here. Sometimes hides can feel too quiet, like a Doctor’s surgery, but not always. If people do chat it is kept at a whisper so that the birds outside are not disturbed. I like to hear a little chat (you could have guessed that) but before we even opened the door of the top hide on this visit we could hear chat inside. We opened the door to see some serious pieces of watching kit. The hide was small. We went to the other side and my daughter whispered along the lines of was I feeling inadequate with my camera! I took a photo of the nest although couldn’t see the ospreys this visit. The nest is in the centre of the picture below. We didn’t stay very long as a third person came and joined in the chat. We wouldn’t have stayed too much longer anyway as we could see more from the live cameras inside the centre. I didn’t properly mind the men chatting but they clearly were regular bird hide visitors by the kit they had and fully knew the etiquette expected. I am always very quick when using my video camera so people don't feel uncomfortable with it running. I always edit the sound out too. On a visit earlier in the month, on April 2nd before the eggs were laid, I captured the footage below from this same hide. Unfortunately it is a little shaky as I didn't have the plate for my tripod with me. You can see the female stretching her wings. The male had come in with a fish for her just before but after a little while he flew away with it again. She didn't even get to taste it! She very patiently waited and waited for him to return. I would encourage anyone to pop into hides when you see them as you never know what you might catch a glimpse of. You don’t have to be an expert to enjoy these facilities either. Nor do you need to have fancy equipment or a field guide for ID's. 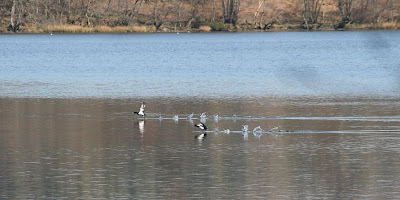 Often there are both binoculars and picture guides of the birds you can expect to see from them. After a long or short walk it’s very relaxing to take a seat and look out the windows of a hide. Perhaps you might even welcome a cooling breeze on your face on a warm day. Oh… did I feel inadequate with my camera? I quietly laughed at my daughter and shook my head, no not at all. Even if I had a simple disposable camera I would still have used it. What I had hoped to get another glimpse of this morning was the yellowhammers at the feeders. 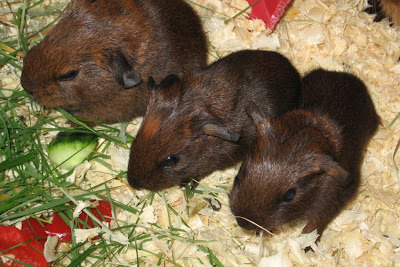 I don’t see them visit my garden. I hoped to get a photo from inside the viewing area of the visitor centre but we didn’t spot them. The first photo in the montage below shows a shaky shot from outside on a previous visit. 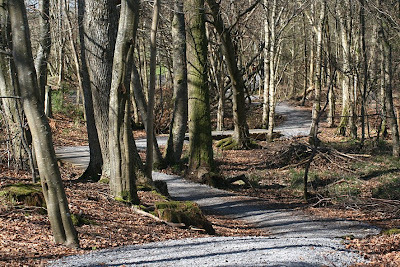 There is a path leading from the car park along the side of the loch. 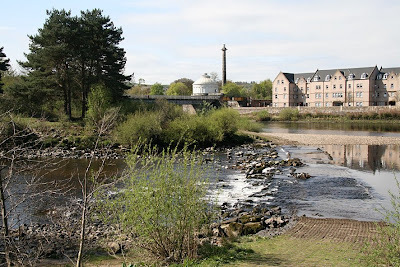 At its end you can cross the road and follow another path to walk all the way to the closest town Dunkeld. It's not a long walk. With a little more time we could walk this another day. The sun was well out now streaming through the trees. 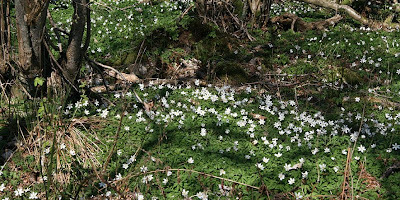 You can see above that we spotted violets and wood anemones, wood sorrel and another small white flower which I haven’t ID’d yet. 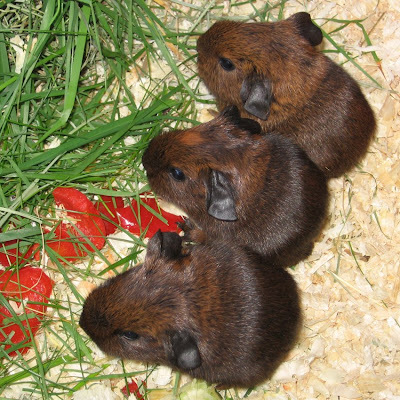 Mm... could it be an alpine strawberry? We also spotted slices of tree trunks on the ground. The first slice I spotted reminded me of a teddy bear face tilted to one side and smiling! I still hadn’t seen the flower I was looking for. 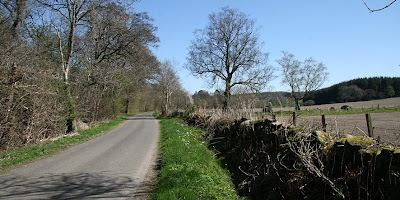 We had walked to the end of the path and then along the road side edge of the Loch for a little bit. Standing now at the edge of the Loch we were able to look across to one of the hides. With my camera’s zoom lens we could see someone looking back across at us. Ah... perhaps they, like us, were looking at the ducks that had just taken off along the water. Returning back along the path to the car park we watched people play golf on the course across the other side of the road. My daughter attempted amusing sports commentary at appropriate points! We met a few people walking this path too. Everyone was out enjoying this lovely sunny morning. The sky was such a beautiful blue colour above us as we came out of the woodland. 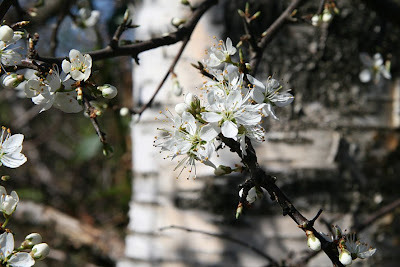 Ah… and just alongside my parked car there was some blooming blossom. We had seen so much on trees this morning so a photo or two was a must. 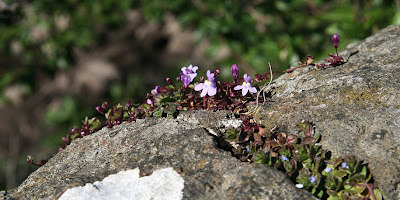 Now, the search was on along the roadside verge that I spotted a particular wildflower on. Have you guessed which one it could be? There is a bird link here. If you turn left from the car park the road is narrow for a while. Two cars can still pass though. I am quite familiar with this road as my Grandmother lived along it. Spaced out along the side of the Loch there are spaces to park one car. I stopped at a couple and walked around each time. I couldn't remember exactly which part had the drift of flowers I was looking for. Teenager daughter stayed in car listening to music this time. Well, I don't blame her with mad Mum out looking for a flower along the grass verges! 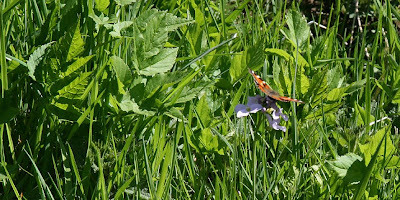 What a delight to spot a young small tortoiseshell butterfly looking for this wild flower too. It beat me too it! 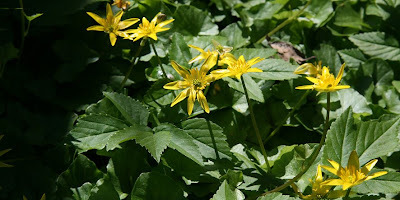 Do you recognise this wild flower now? 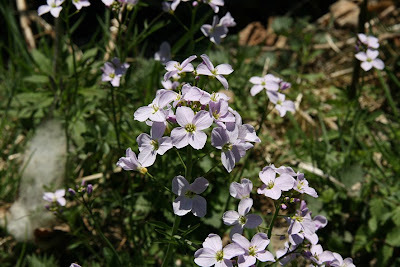 Let me introduce you to my wild flower of the day… Lady’s-smock Cardamine pratensis also known as the Cuckooflower. We saw this on many road verges today but it isn’t always easy getting parked to take photos. 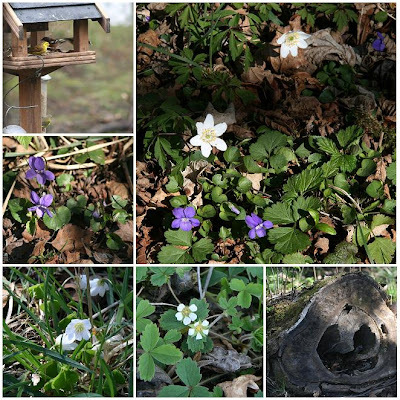 It really is quite a common wild flower and can be found all around the UK. I think its pretty special and have fond memories of collecting them for my Mum when I was a child. 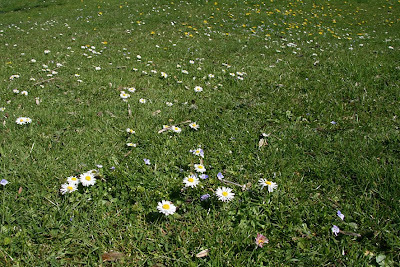 All wild flowers are protected now though so I didn't plan to pick any today. So ,if you see these pale lilac bobbing flowers on stems along road verges as you pass by from April - June they may just be the Cuckooflower. Just watch out for others as mad as me trying to get photos! 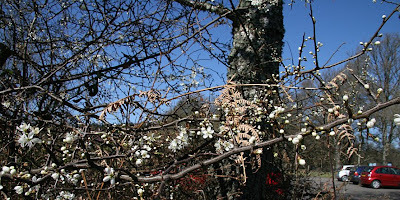 I’d like to dedicate this posting and my following two postings on my tiny part of the world to Earth Day 2009. This has to be worth saving. All photos above were taken on April 19th 2009 with the exception of the yellowhammer.